Last week at the Great American Beer Festival (GABF), as has become a tradition, Jim Koch announced the winners of the 2010 Samuel Adams Longshot competition. As we posted earlier, this year's Longshot competition was only focused solely on Category 23. Beer Judge Certification Program (BJCP) Category 23, Specialty Beer, is the catch-all category. Commentators predicted this departure from the normal complete beer-style competition format would lead to some interesting results. 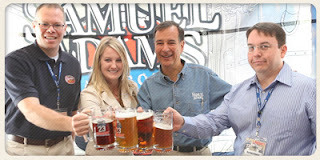 So, who were the winners (information taken directly from the September 2010 Samuel Adams "What's on tap" newsletter)? "Rodney Kibzey - a second time winner (he also won in '07), Rodney's Blackened Hops is sure to please beer lovers when it appears in the 2011 Longshot pack. Harnessing eight years of homebrewing knowledge, Rodney found that combining debittered dark malts and citrusy hops yielded a surprising and unique flavor for this brew. Its black color hints at roasted malt and coffee flavors, but its the big hop character that really steals the show. Packed with citrusy and piney American hops, this beer has a big flavor and clean bitterness." "Richard Roper - Richard’s Friar Hop Ale combines his love of hops with his affinity for spicy Belgian ale. To develop his recipe, he created a hybrid of two styles, uniting the big hoppy taste of an IPA with the spicy, fruity flavor of a Belgian. The toasty caramel sweetness from the malt and Belgian candy sugar mimics a Belgian ale, while the big citrus hop notes of an IPA balance the style. A spicy yeast fermentation and hints of orange and coriander round out the brew. It's a refreshing beer that can be enjoyed any time of year." "Caitlin DeClercq - a first time homebrewer, Caitlin is this year's employee homebrew contest winner. Caitlin's "Honey Bee Lavender Wheat" is an ale brewed with lavender petals & honey. A citrus tartness and slight sweetness from the honey and vanilla balance out the finish in this beer, perfect to sip while kicking back and relaxing." One observations that can be made about the results is that the two non-employee beers feature styles that have become very popular recently, the Cascadian Dark Ale (CDA) and Belgian IPA. The July 2010 edition of Brew Your Own Magazine (BYO) featured an article discussing the origins of the CDA and state it is a deep brown to black ale with prominent citrus and pine hop aroma and flavor, balanced by a light roast/chocolate flavor. The Belgian IPA style, which combines a large hop character and bitterness with the traditional Belgian spicy character found in tripels, has also been gaining favor in the past few years. Another observation of the results is that the employee winner again features a "flavored" beer. The 2007 employee winner was an ale flavored with white grapes. The 2008 winner was a cranberry wit and the 2009 winner was a lemon-pepper saison. I interpret the results to indicate that this year's competition is not that different than previous years. The focus on Category 23 may have led to the selection of some newer styles, but it did not lead to the crazy concoctions that I have seen entered in the catch-all category. It seems that the wildest recipes in the competition, whether the event was limited to Category 23 or not, comes from the Sam Adams employees. The 2011 Samuel Adams LongShot American Homebrew Contest – Category 23 Variety 6-Pack, which features two bottles from each winner, will be available nationwide in select retail stores beginning March 2011. What do you think about the competition and its winners. Post a comment and let us know.